The Cyclones really enjoyed this one. Iowa State pulled off a humongous upset Saturday in Norman, defeating No. 3 Oklahoma 38-31. After their big win, the Cyclones were not shy about celebrating. 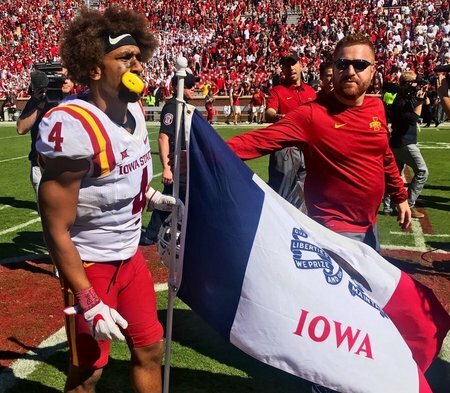 In a callback to Sooners quarterback Baker Mayfield’s move after his team beat Ohio State earlier this season, Iowa State cornerback Evrett Edwards planted the state flag at midfield of Oklahoma Memorial Stadium. As a coach looked on in apparent disapproval, he tried really hard to get it to stick in the ground but never quite got there. Though some Oklahoma fans and players are likely peeved by this move, they can’t exactly complain given that Mayfield was (presumably) Edwards’ inspiration. Mayfield’s flag-plant was talk-show fodder for several days and eventually required an apology, though that incident surely got extra attention because the quarterback is a Heisman Trophy candidate. Clearly, the Cyclones had a lot of fun in defeating the Sooners. Fox microphones caught an Iowa State player on the sideline yelling, “Who’s your daddy?” as the game wound down. We certainly can’t blame the Cyclones for enjoying this win. Iowa State won’t have a bigger win all season, and these players might not have a bigger win in their careers. If they want to holler—and even plant a flag—god bless them.